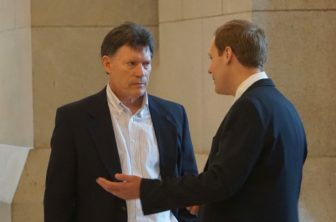 Sen. John Fonfara, left, and House Majority Leader Matt Ritter, both Hartford Democrats, meeting Saturday at the Capitol. The Senate overwhelmingly approved a bipartisan compromise measure to effectively end the state’s fiscal bailout of Hartford after five years. The bill, which passed 28-6 and now heads to the House, would reduce non-education aid to the city by an amount equal to the emergency debt assistance Connecticut contractually pledged to Hartford this spring — but not for five years. The restrictions, developed after many lawmakers said the debt assistance went too far, still are symbolic to some degree. That’s because the debt relief, which should continue for the next 20 to 30 years, is locked in by contract. But future legislatures still could override the mandates in the Senate bill and approve non-education grants for Hartford at any level it wishes. Sen. John Fonfara, D-Hartford, crafted the measure in response to a Republican proposal to end the bailout after just two years, starting in mid-2019. “This amendment does recognize what I believe most in this chamber thought they were supporting” when they agreed last October that the state would bail out the capital city, Fonfara said. Under the debt assistance deal signed by Gov. Dannel P. Malloy’s administration and by state Treasurer Denise L. Nappier, the state will pay off the entire principal on Hartford’s general obligation debt, about $534 million, over the next two or three decades — as well as an undetermined amount of interest. The total will depend on how the city’s debt is renegotiated with bondholders. That’s expected to amount to annual debt assistance of about $40 million per year over that 20- to 30-year period. Many legislators from both parties said they only envisioned the state would provide debt assistance to Hartford this fiscal year and next when they adopted a new state budget last October. But some senators argued Saturday that Hartford needs more than just two years to work out its fiscal difficulties without state assistance. 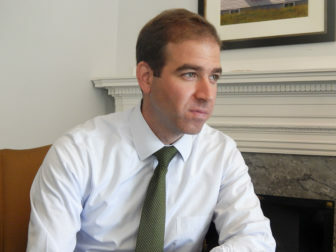 The state’s Municipal Accountability Review Board just approved a five-year plan developed by Mayor Luke Bronin to stabilize city finances. “It’s easy to say, ‘That’s Hartford. That’s their problem,’” said Sen. Tim Larson, D-South Windsor. But the city provides the bulk of the region’s social services, hospitals and colleges and universities, Larson said. It also is home to much of the state’s insurance industry. “We don’t give Hartford enough credit for what it actually does,” Larson said, adding that many of the city’s problems are due to the state’s failure to provide adequate grants to compensate for all of the property it prohibits Hartford from taxing. The city is home to two major hospitals, and several public and private colleges and universities — all of which are property-tax-exempt. It also faces major pockets of poverty and provides the bulk of the region’s social services. Senate President Pro Tem Martin M. Looney, D-New Haven, praised Bronin’s administration for its efforts to stabilize Hartford’s finances, adding that the compromise measure “will give a higher degree of accountability and a greater comfort level” to state officials concerned about bailout. But Senate Republican leader Len Fasano of North Haven, who supported the bill, said it also was important to protect the state’s interests. Or a 1 percent deficit for two consecutive years. Earlier this week, House Majority Leader Matt Ritter, D-Hartford, and Speaker Joe Aresimowicz, D-Berlin, said they would not oppose an effort to limit the Hartford bailout.